We can’t get enough of our blueberries and cranberries since we were told they’re packed full of super powers. To get more of your daily antioxidants, try this blend of real berry pieces, which deliver a punchy, fruity taste unlike any fruit tea you’ve tasted before. Again, we’ve looked after the berries, not crushed them. Compare our whole berries in our tea temples to the crushed up bits in your regular tea bag, whole is best. Super fruity, this cheeky drink is a little tart. Slow and lifeless. 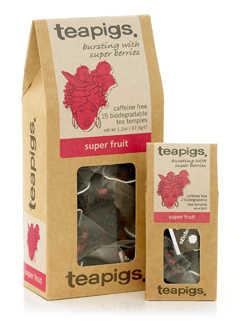 The antioxidants in our super fruits will help stave off “Squashed Hedgehog Syndrome”. Hibiscus, elderberry, blackcurrant, raisin, flavouring, lingonberry, blueberry.